"If you're looking for a green chile chicken enchilada casserole with a kick, this might be the one for you. I found the base recipe scouring the web for something that would taste like my ex-mom-in-law's casserole, which was to-die-for, and I've tweaked it a few times to make it my own. Try throwing in some jalapenos for even more kick." Heat oil in a skillet over medium-high heat; saute green chile peppers, onion, bell pepper, corn, black beans, and garlic until onion and bell pepper are tender, 5 to 7 minutes. Remove skillet from heat. Stir chicken, 1/2 cup enchilada sauce, and black pepper into vegetable mixture. Spread 1/4 cup enchilada sauce in the bottom of an 11x17-inch casserole dish. Lightly coat 1 side of 18 tortilla quarters with sour cream and arrange, sour cream-side up, in the casserole dish. Spread 1/2 of the chicken mixture over tortilla layer. Stir green chile salsa into the remaining chicken mixture. Sprinkle 1/2 cup Mexican cheese blend over chicken mixture layer in the casserole dish; top with 10 tortilla quarters. Pour 1/4 cup enchilada sauce over tortilla layer and cover with chicken-salsa mixture; add 1/2 cup Mexican cheese blend. Lightly coat 14 tortilla quarters with sour cream and arrange, sour cream-side down, over the cheese layer. Spread 1 cup enchilada sauce over tortillas and top with remaining cheese. Bake in the preheated oven until cooked through and cheese is bubbling, 20 to 25 minutes. 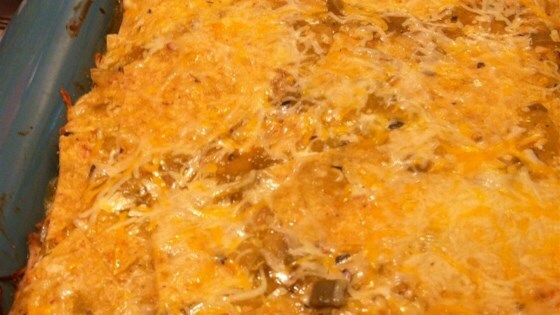 Try this quick and easy green chile chicken enchilada casserole. not bad, more of a chicken and green chili pot pie. This is a delicious recipe. The only thing I changed was adding jalapenos along with the chiles and using the sour cream generously. This recipe is good just as it is written. Only changes made: used fresh jalapenos (2), used about a cup of sour cream and much more shredded cheese. Great recipe. My Mexican husband asked me to make enchiladas for dinner, so I knew this dish already had a tough audience. My husband AND children loved this dish, beans an all! I was one proud mom and wife. Followed the recipe to the letter. It was delicious! My roommate ate most of it. Lol. I will be making this one often! I added a lot more cheese because I favor the cheesier cassarole. This is a great tasting and easy recipe. My friends over for dinner loved it.